The Black Hawks existed as an NHL franchise since 1926. They are considered one of the "Original Six" franchises of the National Hockey League (NHL). So called because from 1942 to 1967 Chicago, Boston Bruins, Montreal Canadiens, New York Rangers, Toronto Maple Leafs, and Detroit Red Wings were the only teams that competed in the NHL. The NHL was formed in 1917 and only two of these original six franchises Toronto and Montreal were founded before 1926. The other four Original Six franchises including Chicago were founded in 1926. Now from the time of the NHL's founding other teams had come and gone through the years until 1943. The Stanley Cup was created in 1892 by Lord Stanley who was the Governor-General of Canada from 1888 to 1893. He was originally a British nobleman and politician and he offered this cup as the prize for amateur hockey teams in Canada. By 1926, the NHL were exclusively competing for the prize known as Lord Stanley's Cup. Over the years the Black Hawks have competed for the Stanley Cup in 1930-31, 1933-34, 1937-38, 1943-44, 1960-61, 1961-62, 1964-65, 1970-71, 1972-73, 1991-92. They have won cups in 1934, 1938, and finally 1961. In addition they have made conference champion in 1992 which was their last Stanley Cup appearance having been defeated by Pittsburgh. That is in addition to 14 division titles starting in the 1969-70 season. This season (2009-10) they will play for the Stanley Cup for the first time since 1992. They also won a division title and conference title this season. 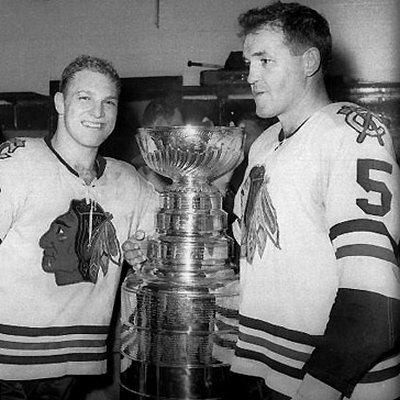 The top image is of Bobby Hull and Jack Evans another teammate (if you know who that is please leave a comment) standing with the Stanley Cup after their Stanley Cup victory against Detroit on April 16, 1961. This info was found on June 10, 2010 at Chicagoist.